The new energy industry is working to categorize the various types of microgrid business models. The primary goal is to minimize microgrid system costs such as project development, system design, commissioning, service, support, and funding. Microgrid categories will help promote standardized designs – which will enable repeatable, modular, and scalable systems. In addition to the standards and new business models, there are a number of signifigent regualtions, government incentives, and climate change actions. DERs and microgrid projects may qualify for government grants or production incentives. 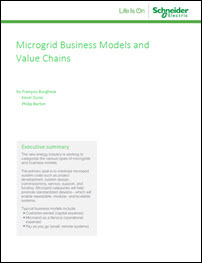 To learn more about microgrid business modes and value chains download this white paper.